Small amounts of transient water have formed transient features on the surface of Mars, like these streaks in Hale crater. WASHINGTON — "Water, water everywhere, nor any drop to drink" epitomized terrestrial seafaring exploration, and precisely the same problem may haunt any future explorers on Mars. 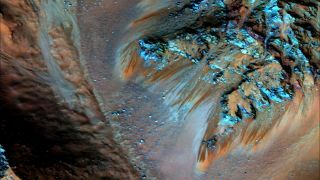 There is plenty of water on Mars, but it's frozen, locked in water-rich minerals, tucked away below the surface — or a combination of those challenges, which is why we still don't know where it all is. That's a problem for Rick Davis, assistant director for science and exploration in the planetary science division at NASA, because he is heading the agency's project to evaluate potential human base sites on the Red Planet. But he thinks tackling this problem could help bring scientists and would-be explorers together. For Davis and his compatriots, water and ice represent a cure for, on the one hand, all the ways humans rely on water to survive, and, because it can be split into hydrogen and oxygen, as rocket fuel to carry people and cargo back to Earth. And scientists want to study Martian ice in hopes of learning more about the planet's climate history and potential past habitability. In Davis' view, both groups are stymied by an important blind spot in current instruments, which means they can't understand what's happening just below the surface, less than 33 feet (10 meters) down. That's a particularly important region of the subsurface because it's the most accessible, for humans and robots alike. And Davis sees another area where different communities pursuing different goals on Mars share a specific need — monitoring and forecasting the weather. That will help scientists better understand planetary processes, and would-be explorers will need to know when weather conditions could deter their flights to or from Mars — think of rocket-launch scrubs and airport- flight delays here on Earth. Better weather data will also feed planetary-protection efforts at Mars, which work to protect sensitive areas where life is and has been most plausible. Humans can avoid those areas themselves, but they could still contaminate them from a distance if microbes or other Earth-germs are blown across the planet's surface. "Once humans go there, we're going to have releases, the joints on spacesuits will never be pure, you're going to have accidents in terms of hab[itat]s," Davis said. "Understanding where all the junk goes that gets released from a human base is really a prevailing wind issue." All that means that when it comes to water and weather, groups of Martian-minded humans may have more in common than they sometimes think — and could perhaps collaborate to tackle steep technology challenges and large price tags. "All three of those communities are rapidly converging on the idea that we really need to understand what we're dealing with," Davis said.